Singing and Spinning: Guess who learned how to ride a bike? 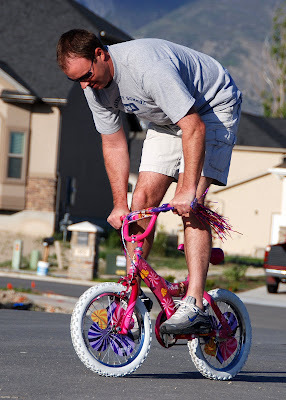 After hours and hours of practice, Scott was finally able to remove his training wheels and ride his Barbie bike up and down our street. As a wife and mother, I would have felt much better about his accomplishment if he would have been wearing his helmet and pads. Fortunately, Jade had her helmet and knee pads on when she took a spin on her Barbie bike for the first time. Which is important since I am a bit of a worry-wart. 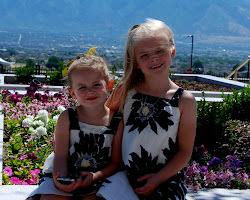 She was a little frightened during the whole experience, but she stuck to it. 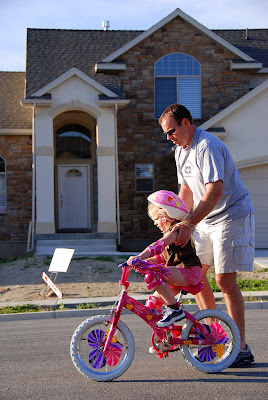 The first few times she would start to lose her balance, she would just let go of the handlebars. She learned after a few times that that just wasn't the way to go. 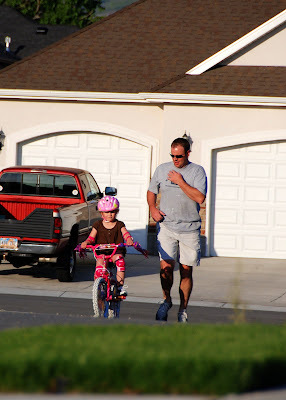 After a few laps up and down the street, she was able to do it on her own. As she finished her final lap, she turned to the drive way, pushed back to brake and fell to the ground. 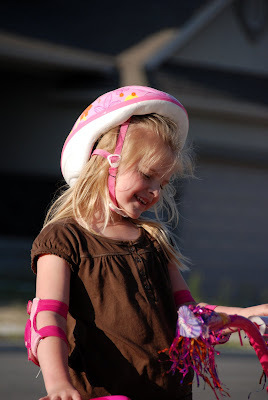 Luckily, her knee pads protected her from any harm and she was excited to ride a bike and no tears were shed. She just grinned and gave us high five's. Finally, a picture of our triumphant biker. Way to go Jadybug! We're so proud of you....can you teach Luke how to fear a little less? Very cool! She must be so proud!